Knob and tube electrical wiring is primarily found in home older than 60 years old (I’m looking at you, Old South and Old North). Back when it was installed, electrical services weren’t taxed like they are today. Knob and tube in today’s homes presents challenges both with fire safety and insurance concerns. A little knowledge can help avoid disaster. The knobs are the porcelain posts that the wire threads into. The tubes refers to ceramic tubes used to insulate the wire through joists and other structural members. Not to get into too much detail, but knob and tube is problematic because today’s electrical needs have out grown it. Aside that it has no grounding, and therefore cannot run most of your electronics properly (without doing stupid things like removing the grounding on your electrical cord), it’s bad because it’s probably overloaded, and it’s old. And when it’s overloaded, it gets hot. Worse, if it’s old and brittle. Plus, over the years, people have spliced into it. Why is it overloaded? 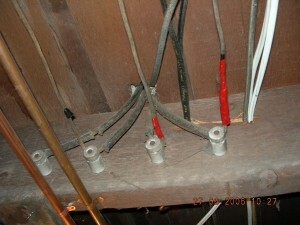 Because back when it was installed, three circuits may’ve supplied the entire house. Back then, we didn’t have to worry about computer equipment, multiple compressors (dehumidifiers, beer fridges, fridges, microwaves, coffee makers, irons, etc, etc). So imagine all that stuff on one line. The wires get hot. 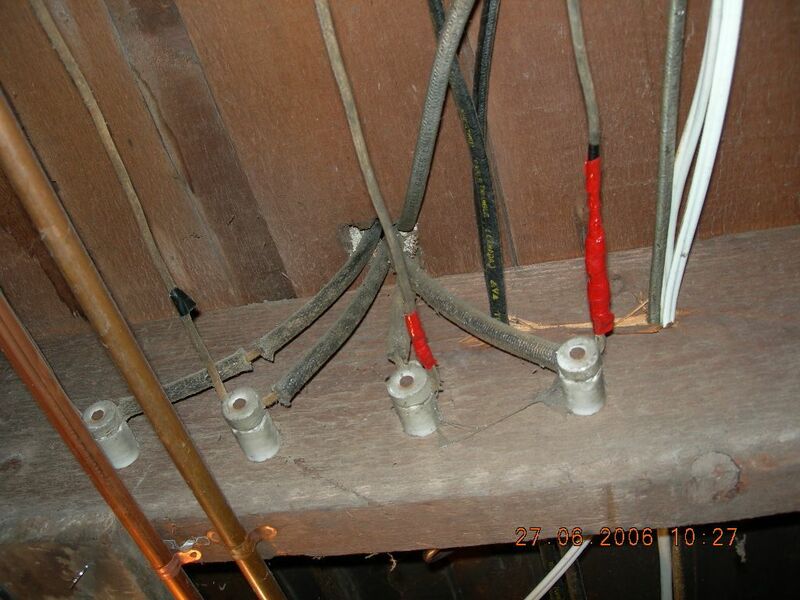 If the exposed wire touches something combustible, well, it’s only a matter of time before it causes a fire. In one house I renovated (a house with 3 rental units) ONE knob and tube line supplied: 2 fridges, 2 microwaves, 18 electrical outlets, 8 lights. Wowser! You might not know you have it. First, all exposed wire may’ve been replaced. But all the stuff in the walls and ceiling are still knob and tube. I’ve encountered several times (in both touring homes, and in renovating) that several unsavory people cut back the knob and tube to outside of the electrical box, then spliced in newer wire so it looked like all the outlets were modernized wires when in fact, it was a wolf in sheep’s clothing. Sadly, there isn’t an easy fix. The stuff is dangerous (and gets more dangerous with each passing day as it continues to deteriorate). You need to get rid of it. All of it. Yes, that means cutting holes in walls, ceilings, and in lots of places. If you have a one story home without a finished basement and attic — congratulations! The fix will be fairly pain free ($3000). If you live in a 2-story with finished basement and attic, the job becomes that much more challenging. You can expect in the $7000 range to replace it all. This is not a job for a handyman or a weekend warrior. This is a job for a licensed and insured electrician.